Michael Anderson started San Diego-based Radiant Technologies Inc. because he wanted to give software clients a personalized touch. The world traveler has lived in six different countries, including Singapore and Denmark, working with various large software corporations. When he moved back to San Diego in 1995, he soon realized old clients weren’t getting great service. “Though my experience has been with large software companies, they didn’t give good service the way I wanted to deliver it,” Anderson said. Since then, he’s helped various small to midsize companies to select and implement the right Enterprise Resource Planning software. After going through a couple different iterations, Radiant was officially established in 2005. The global provider of Enterprise Resource Planning software services has landed on the prestigious Inc. 5000 private companies list for the last two years in a row. Radiant posted $2.7 million in revenues in 2011, up 58 percent from 2008, according to the 2012 list, ranking No. 3356. Radiant’s job as a consultative-type company is to work with clients and determine their software needs. “When companies are growing and they are outgrowing their existing systems, they normally know that because they have to add people to keep up with their growth,” Anderson said. Radiant offers Microsoft Dynamics and SAP Business ByDesign packaged Enterprise Resource Planning software. “We take their requirements and match them with our range of products. We will suggest one or two products they should take a deeper look at,” he said. Radiant's services include sales, installation, classroom training, maintenance, development, integration and support. 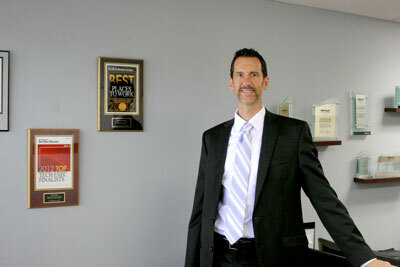 “We are a leader in cloud-based business software in Southern California,” Anderson said. More than 30 of Radiant's customers have been investing in the software it provides for 10 years or more. The average lifespan of one of the software products is about three years. Microsoft Corp. (Nasdaq: MSFT) and SAP AG (NYSE: SAP) are two vendors that make the software that Radiant resells. “It’s great getting it from Microsoft because they are creating other platforms, like Windows, and they make that all very easy,” Anderson said. One of Radiant's clients is San Diego-based Elum Designs, a custom printer company using SAP Business ByDesign. The company previously had four different software packages to handle business processes, including accounting, finance, shipping, manufacturing and other operations. Consolidating those packages and tacking on SAP’s software helps eliminate double entry. “If someone had to put one thing in one system, they didn’t have to run over and put it in another,” Anderson said. “A salesperson could see a customer sales history, and as they enter quotes and orders it would go right into production,” he said. As product is shipped out, everything is automatically updated in real time. The system is mobile-enabled, so that iPhones and Androids can access it from anywhere. SAP, the largest Enterprise Resource Planning software company in the world, has top-notch hosting facilities. That’s a big selling point for some clients. Companies can sign on to the software for a year, but they typically turn into long-term customers. As chief executive officer and founder of Radiant, Anderson’s day-to-day duties include working with both current and potential customers. He likes finding out what customers' strategic visions are and then helping them craft it through one of their software products. “I spend some time bringing the right people on board for us,” said the Pittsburgh native, who moved to San Diego in his mid-20s. Over the next 12 months, he wants to establish a physical presence and plant more salespeople in another part of California. He has his sights set on “big, fast-moving markets” in Los Angeles, Orange County and San Francisco, which are fertile grounds with potential clients. The company has customers in the recycling and clean technology industries, particularly in renewable biofuels, as well as in wholesale distribution and manufacturing. Many of Radiant's employees work virtually, he said. Its team is made up of analysts, developers, trainers, support staff and consultants. Anderson made his mark in the business-to-business software industry by starting and growing companies around the world. In Singapore, he was managing director of the Southeast Asian region for a software reseller with 15 offices in 11 countries. Connections he formed abroad have helped him score current clients who have operations in Asia and Europe, and he currently takes “one or two good trips” per month.